It’s lost our love, our love’s not right! I can’t help but think of you. "Customer Contact Centre, *cough* *cough* how may I *cough* help you?" The frankest answer would be: "Get over your cold!" I work in a shared cubicle, where virus thrive off of computer keys, desk tops and telephone surfaces. The sounds around me are equally...phlegmy. So I've been packing my pockets with cough candies and hoping for the best. 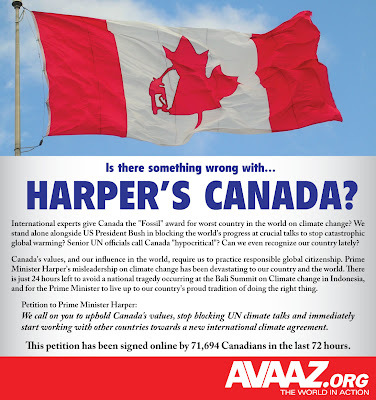 This was avaaz.org's ad that was printed in Canadian papers on December 14th, the last day of the UN Bali Summit on Climate Change. With all the snow and holiday hoopla, it might be difficult to focus on anything other than what to stuff your stocking with. But let us remember that life isn't all chestnuts roasting on a an open fire. Our planet is in danger of getting roasted out of space! Imagine the world as a mystery suitcase. It's not. We know what we put into it. The UN Bali Summit on Climate change last week seemed to be moving slowly but progressively towards some specific targets. Not surprisingly, the US was undermining those talks by blocking the conference. Then Canada (WHO SIGNED THE KYOTO PROTOCOL!!! ), with just a few days to go, used that as an excuse to block other Kyoto countries from moving on, arguing that a deal without the US was no deal at all. That's why we can't take our eyes off our dear leaders or what they are doing. When Stephen Harper was elected as prime minister of Canada, he promised to make politics less corrupt and more transparent. Well, now we have to stick it to him if we expect him to represent our interests, not just the interest of the powers that be and corporate cozeners. Luckily, outraged protesters managed to pressure Stephen Harper to eventually go with the consensus to reduce carbon emissions by 20-40% by 2020. The US also finally caved. It is long way from specific binding targets but it does show that we, the people, still have some power over our politicians. There's something wrong with Canada but it's not our belief in the purpose of the Kyoto Protocol. We can't stay silent or else that belief will never translate into action, which is what the world needs more now than ever. Once upon a time there was a valiant old furnace. It burned day and night to warm the hearts and minds of its inhabitants. But the inhabitants were busy playing their instruments, having parties and messing up the house. They didn't have time to think about rising gas prices. They didn't have time to thank the furnace. They didn't even have time to fix a window that was broken! And it was winter time! They took the valiant old furnace for granted while its heat was being constantly wasted. Still, it kept the house as heated as it could, as a good furnace should. Then the big bad frost came and things weren't the same but the furnace was only more inflamed with passion! It pumped and it pumped to protect its little inhabitants from the cold. However, when the furnace wasn't looking, the big bad frost got wind of the furnace's efforts, sneaked up behind the furnace and blew its pilot light right out! What could be worse? Try as it might, the furnace could not get a single spark of energy to rejuvenate its former fieriness. It would be nice to be here right now. Remember how in Season Pangs I suggested that people need spirit to get through this season, especially if say, their furnace were to break down in minus 15 degree weather? Well, it seems I've really jinxed myself because MY FURNACE HAS BROKEN DOWN! Meanwhile, it's simply a lucky coincidence that this comes at a time when I have a broken window and when the wind chill makes the cold even colder than minus 15. 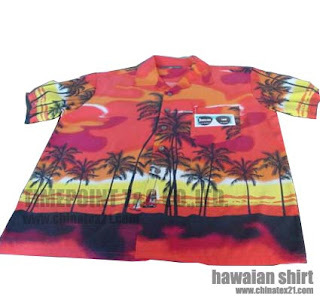 So I bet you can guess that I'm not lazing around in my Hawaiian T-shirt. The repairman will be by shortly to confirm that the pilot light is out, which apparently is normal considering the high winds that make it feel like it's minus 18 outside. Although I might be a master at hotwiring my thermostat with a paper clip, I'm not going to mess around with a machine that has the power to blow my house and I up. When the repairman comes, he will show the furnace the way, the truth and most importantly, the light, (aka a match to the pilot light), then my valiant old furnace will come back to life. Meanwhile, I've been expressing my "spirit" by wearing my boots in the house, burning candles and watching my breath as I sip hot chocolate with marshmallows. I feel now as if I know what it is like to live in an igloo. The water in my toilet hasn't frozen yet though, which I take as a sign that maybe the spirit alone has enough in it to kindle a little bit of warmth. When this is all over I'm going to hug my furnace.